Gleaming slopes of snow and endless powder: this is what every ski tourist, freerider, and snowboarder calls paradise. And that's exactly what it would be - if not for the constant threat of avalanches. They dampen the unclouded joys of winter sportspeople everywhere. 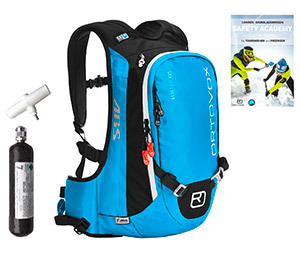 If you have a set of high-quality avalanche equipment, this danger isn't quite averted. But if the worst comes to pass, you can still provide effective help. A complete avalanche airbag set consists of an avalanche probe, an avalanche transceiver, and an avalanche shovel. It's important to remember that even the best equipment can't stop an avalanche. Only rational tour planning and experience in evaluating slope safety can do that. Where appropriate, you might also have to discontinue a tour or avoid entering a slope. Even the most beautiful powder runs and the most interesting climbs have to be safe. Under no circumstances should you assume increased risks just because you have an avalanche airbag set! 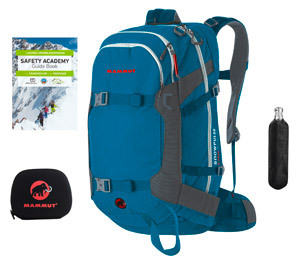 What should I have in my avalanche airbag set? As mentioned earlier, a good set contains an avalanche probe, an avalanche transceiver, and an avalanche shovel. Let's start with the probe. A good avalanche probe is stable, ready for immediate use, and ideally lightweight. The lighter the probe is, the less likely it is to weigh down your backpack. That way, you'll always take it along. Avalanche probes consist of multiple segments. In emergencies, they are connected internally with a cord or cable. Successful pinpointing demands regular training and a lot of practice. This holds true for probes as well as the other pieces of equipment. Avalanche shovels have to be robust, light, and compact enough to store in your backpack. Ergonomic handles make work easier. An avalanche shovel isn't just for rescue. It can also be used to build a small ski jump or a snow bar. Avalanche transceivers are the most expensive components of avalanche sets. Various manufacturers produce them, but the function is always the same. They send and receive communications at the same frequency worldwide. In the past few years, several new functions have been developed in this field. They make rescue searches easier with the help of digital technology. The same principles apply to all electronic assistance. You have to understand the device and be able to use it in a panic. But above all, you have to practice, practice, practice!